ACCESSORIZE! 250 OBJECTS OF FASHION & DESIRE. I saw this book at a bookshop and fell in love right away. It’s a publication of the Rijksmuseum in Amsterdam (ISBN 9789086890453 , 19.95 euros, 272 pages, 250 illustrations, bilingual English/Dutch). 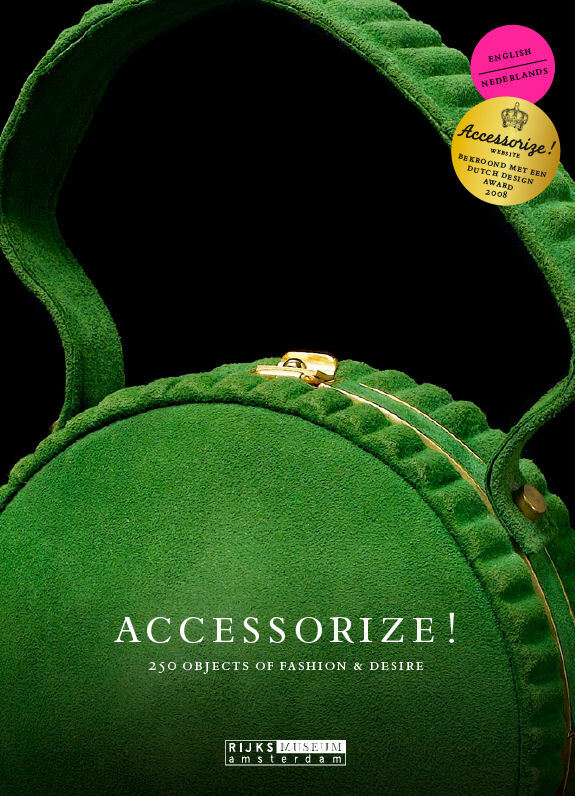 When I got home and looked at it closer I realized that the book is the companion to the Rijksmuseum online exhibition about accessories, an exhibition that has been there, without me knowing, since 2008! Both the book and the website have been designed by Joost van Grinsven and Cristina Garcia Martin. Because it’s an online exhibition it doesn’t matter if you’re at the other end of the world, you can see it, and I recommend it highly: Accessorize 250 Objects of Fashion & Desire. The book is sorted by colour, with gorgeous pictures of hats, umbrellas, parasols, fans, shoes, gloves, handbags, combs and more, it’s both in Dutch and English. The same items that are on the book can be seen online, with the advantage that they can be sorted, not only by colour, but also by category, material, period and topic. The images can be zoomed in a lot too. The only thing that I miss is a 360º view… but I know it’s asking too much! The Rijksmuseum has four Schiaparelli hats in their collection. The lady who bought and donated the Schiaparelli hats said (I quote from the web) “Hats by Elsa Schiaparelli were not meant to give a woman style or make her more elegant; her clients already had that! Schiaparelli hats were designed to attract attention. Her often unorthodox models were always so beautifully made that they never made the wearer look ridiculous”. -Link to the hats part of the exhibition: click here. -Link to the feathered hats animation: click here. Right now, so it seems, accessories are almost more important than clothes. Unique to this day and age? Far from it. For centuries men and women have used accessories to embellish their outfits. For it’s that one designer bag, those handmade shoes or that unique scarf that makes the difference between trendy, rich, original, stylish-and not. It’s true today and it was true in the past. The Rijksmuseum has a collection of exceptional accessories from different eras and different countries-from brightly-coloured fans to gold-rimmed spectacles, from lavishly embroidered gloves to couture hats with extravagant feathers-and almost all limited editions, for that was the way it was. A source of inspiration to one person, an object of desire to another, but always a delight to behold.